As regular readers of this blog know, I’ve been to several ballparks in this past year. Last summer I went to Detroit’s Comerica Park, while this July I went to New York City’s New Yankee Stadium and Citifield. 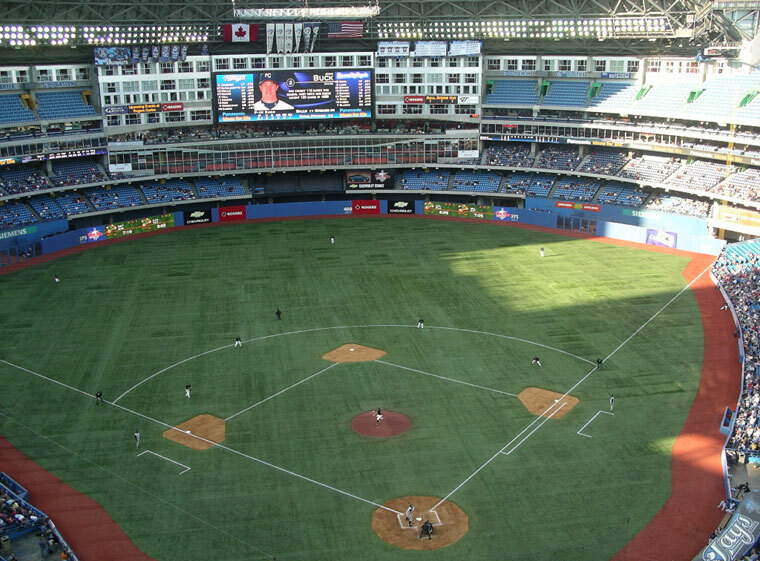 However, I had never considered reviewing the Rogers Centre, the ballpark in my hometown Toronto. Not because it’s unworthy, but because I was worried that I would be too hard on a stadium that has become a scapegoat for the attendance woes of the Toronto Blue Jays as well as the Canadian Football League’s Toronto Argonauts. But on Tuesday night I returned to the former SkyDome after a month without attending a Jays home game and I realized, hey, this isn’t so bad. First of all, I was buoyed by the recent ESPN study that found the Rogers Centre to be one of the cleanest stadiums in all of professional sports, a small club that includes the Air Canada Centre, home of the Toronto Maple Leafs and Toronto Raptors. There are only nine other venues that have spotless health records. Also, after my 45 minute subway ride to Citifield in Queens, New York, I have found a new appreciation for the downtown location of the Rogers Centre. It’s a five minute walk through a dedicated passage from Union Station, giving the ballpark access to the Toronto Transit Commission and the provincial GO Trains. The neighbourhood is ideal for out-of-towners hoping to kill some time before the opening pitch. Right beside the ballpark is the CN Tower, the second tallest structure in the world. Across the street is the Steam Whistle Brewery that serves one free sample beer to any visitor over the age of 19 and also has a variety of antique train engines. Although it lacks the charm of the newer retro-styled parks like Citifield, Comerica and New Yankee Stadium, the Rogers Centre has all the same amenities with large and conveniently placed washrooms that are easier to find than the facilities at the American stadiums. Of course, the former SkyDome’s big draw is its roof. Although it seems like a quaint 1980s concept, the retractable dome remains practical in a city that can have snow in April. The closed dome also means that the stadium is useful all year around. Don’t get me wrong, there Rogers Centre does have its drawbacks, especially the feeling that it is always half-empty. It can’t be helped - its seating capacity is fifth largest in Major League Baseball but Toronto averages the fourth smallest crowd in the Majors. As a result, the stadium seems deserted for most games. As far as service goes, the staff at concessions and in the stands are fine. However, the public announcer and the rest of the in-game entertainment seem desperate to energize the staid Toronto crowd. They don’t seem to realize that Torontonians are almost always quiet at concerts, festivals and other events. It’s just in the city’s character. Unfortunately, this year they’ve tried to boost the crowd’s excitement by cranking the music as loudly as possible, stifling conversation and drowning out any attempts at chants or cheers from the crowd. The stadium may not be quiet, but the crowd is. It distracts from the action on the field and takes away from baseball’s pastoral roots. Toronto’s Rogers Centre is far from perfect, but it’s also not the worst ballpark I’ve ever been to. It’s accessible by public transit and is reasonably priced. It’s clean and family friendly. Unlike Fenway Park or Yankee Stadium it’s better suited to locals than visiting fans, but that’s not a serious offence for a stadium. It serves the city of Toronto admirably. Tonight is one of the most anticipated television events of the summer: the return of the Jersey Shore. The cast of the mega-popular MTV reality show have been brought back for a second season, this time making like Lebron James and taking their talents to South Beach, Miami. Just like James’ decision to join Chris Bosh and Dwyane Wade on the Miami Heat, Jersey Shore is surrounded by controversy. For those somehow unfamiliar with the Jersey Shore phenomenon, it’s a really simple concept: MTV put eight young people, primarily of Italian-American descent, into a house on the boardwalk of Seaside Heights, New Jersey. All the cast had to do was work together at a local novelty t-shirt shop, go out together and, of course, allow the cameras to follow them wherever they went. As young people are wont to do, they got drunk, hooked-up with each other or people at the local night spots and, above all else, got into fights, culminating in cast member Ronnie Ortiz-Magro being arrested for aggravated assault. More negative publicity swirled around the program when previews showed petite cast member Nicole “Snooki” Polizzi taking a punch to the face from a drunken party-goer at a local club. Although Snooki was physically unharmed, the episode aired with the assault cut out and bookended with public service announcements about the dangers of domestic violence. Despite these controversies, the show took off in popularity and phrases like “The Situation”, “Grenade” and “Fist Pump” have entered the popular lexicon. Although it has a loyal following, there are many who cannot stand the show. Those critics are right. At its heart, Jersey Shore is trash television that appeals to the lowest common denominator. But ask any archaeologist or anthropologist – a culture’s garbage can be incredibly revealing about society, and Jersey Shore is no different. The show provides a glimpse into a world full of buff bodies and fragile egos, where a total lack of self-awareness meets with a hunger for fame with explosive results. A close examination of Jersey Shore can serve as a launching pad for discussions of all kinds of serious issues. Topics can include the educational system in the United States after hearing the cast mangle the English language, the state of healthcare in North America as they spend an equal amount of time working out and destroying their skin with tanning beds or religion as Pauly “DJ Pauly D” DelVecchio tries to reconcile his Israeli girlfriend’s Judaism with his own Roman Catholic upbringing. Most intriguing is the casts attitudes towards sexuality, gender roles and family. For example, although all the cast members enjoy some level of sexual promiscuity, they also prize loyalty to one’s partner: Sammi "Sweetheart" Giancola is incredibly possessive of her boyfriend Ronnie, but offers no objection when Jennifer “JWoww” Farley cheats on her boyfriend with Pauly D.
Similarly, Angelina “Jolie” Pivarnick objects when her single male roommates bring home some young ladies to enjoy the house’s hot tub. However, it’s later revealed that her boyfriend is a married man and it’s implied that she had a fling with Michael "The Situation" Sorrentino on their first night in the house. Angelina made a quick exit from the show after a fight with her boyfriend “forced” her to miss a shift at work, resulting in her eviction from the house. Relieved that she’d been ousted from the house, the remaining roommates declared that they were a family – having only lived together for approximately one week. At one time or another all of the female castmates declare that they want to settle down and start a family with a good guy. Most desperate to find marital bliss is Snooki, who spent the entire season trying to bring men home from local clubs. When Vinny Guadagnino’s family came to visit the Shore House, all the female roommates expressed their admiration for her as she cooked for them and cleaned their house, even cutting her son’s food for him. That’s how a proper woman acts, in their mind. Yet they continued to do backflips in mini-skirts and thongs, make-out with random men (and sometimes women) and have one night stands with strangers. Most fans of the show call Jersey Shore a car wreck – their morbid curiosity prevents them from changing the channel - but I think it’s the inherent hypocrisy in the actions of the cast that is fascinating. Where do these people come from? How did they develop such a jaundiced view of the world? What do their parents think of the show? It’s a fountain of rhetorical questions. It’s a stunning look at a segment of North American culture that is engrossing and depressing, educational and trashy, entertaining but dulling. The second season has big shoes to fill, but I expect it’ll be equally fascinating, at the very least to see how fame has altered the housemate’s already twisted perspective on reality. 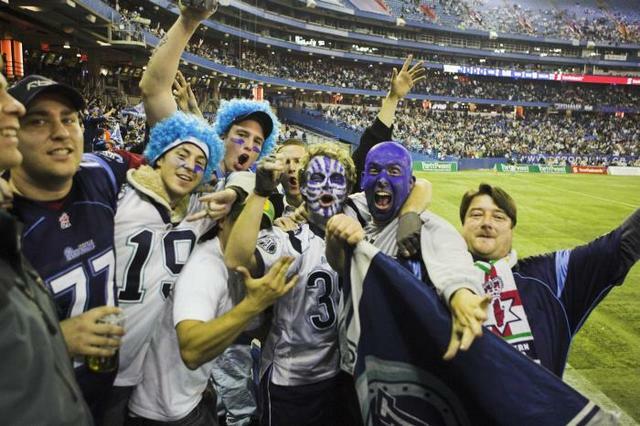 Argonauts fans are a rare breed in Toronto. Byron Parker cinched the Toronto Argonauts 24-20 win over the B.C. Lions with a late interception that he returned for a 41-yard touchdown. The victory gives the Boatmen a 3-1 record, tying them with the Montreal Alouettes at the top of the Canadian Football League’s Eastern Division. This is big news for Toronto’s beleaguered franchise. They’ve been struggling financially since 2003 with past owners barely avoiding bankruptcy and needing bailouts to keep the club afloat. This tumult led to David Braley – also the owner of the Lions – buying the team before the start of the 2010 season. Getting some wins and rejuvenating the Argonauts’ tattered image is crucial to reviving the most successful team in CFL history. Here’s the thing – most people in Toronto don’t care. Once upon a time this city was painted Double Blue every summer, but the Argonauts have long since ceded their hold on the sporting public to upstarts like the Toronto Blue Jays and, more recently, Toronto FC. Attendance continues to suffer at the Boatmen’s home, the Rogers Centre, while apathy for Canadian football grows unabated in the nation’s largest city. As the Vancouver Sun’s Mike Beamish pointed out on Sunday, Toronto’s two home games this season – both wins – are the lowest announced home attendance figures for the Argos since 2003, when the team was on the verge of folding. How did a once proud franchise end up like this? There are many contributing factors including unstable ownership, an increasingly crowded market that has seven other professional sports teams and the cavernous Rogers Centre. The biggest problem though, has been that the Boatmen have ignored the power of television. It has been a long-standing Argonauts policy to black out home games on television in an attempt to bolster attendance numbers. This tactic may have worked for the Boatmen in the 1950s, 60s and 70s, but it’s cost them since then. Television has only grown in stature, becoming a staple in practically every household, while ticket prices have risen, making it difficult for the average fan to go to several home games in a season. Because Torontonians are unable to watch the Argonauts on TV, they don't know who is on the team or what to expect from a CFL game. There's no draw for the casual fan. As a result, an entire generation of Torontonians have grown up unfamiliar with the Canadian Football League. It’s an important cohort too. The so-called Echo generation, the children of the Baby Boomers, are the second largest generation in Canadian history. Instead of being raised on Argonaut heroes of the 1980s and 1990s, most Torontonians in their 20s and 30s have fond memories of Blue Jays like Jesse Barfield, George Bell, Robbie Alomar and Joe Carter. Sure, there were some highlights for the Boatmen like when they were purchased by John Candy and Wayne Gretzky. The Doug Flutie years also saw a brief bump in interest. But in both cases the fame was fleeting, easily overcome in a crowded, Leafs-centric city. There’s no issue with the product: Canadian football is an exciting variant of the game. The issue is that the Argonauts are operating under the assumption that Toronto is like any other market in the country when it’s not. If the Double Blue want to improve their market share, they need to recognize the power of television and make a concentrated effort to appeal to fans outside of the Rogers Centre. They need to win over the fans on their couches, not the ones in the stands. Sitting in the bleachers at Citifield, home of the New York Mets, is a world away from watching a game across the East River at Yankee Stadium. Just getting there takes 45 minutes by subway train, taking you far from the skyscrapers of Manhattan to the relatively open space of Queens. Given its proximity to LaGuardia airport, the drone of planes is in constant competition with the organ as opposed to the bass-heavy hip-hop and rock played by the Yankees. Most striking of all, the atmosphere is friendly and family-oriented. It's hard to believe that it's the same city. 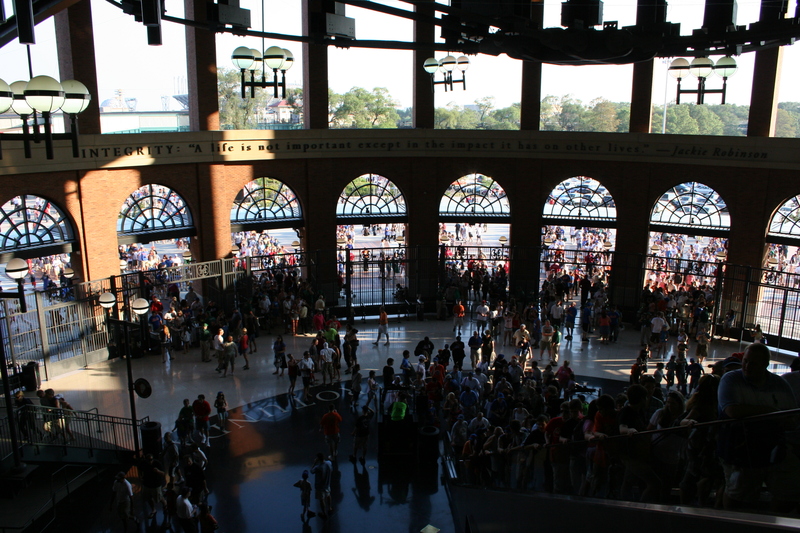 Although the exterior to Citifield is rather bland, the interior has an eclectic, retro-feel. The seating sections are layered on top of each other and crammed into odd angles, although the seats themselves still have lots of leg room. The Jackie Robinson Rotunda serves as the main entrance to Citifield and is lined with inspiring quotes from the Hall of Famer. Spaces like the Jackie Robinson Rotunda tie the history of the Mets to the Brooklyn Dodgers, their spiritual ancestors of in the National League. That retro vibe translates well into Citifield’s concourses that are full of modern concessions modelled to look like traditional ballpark stands. I attended New York’s heartbreaking 8-6 loss to the Cincinnati Reds on July 5th. Since the Mets hadn’t played on Independence Day, the stadium was in full patriotic splendour. Although the Yankees had a stirring tribute to Lou Gehrig the day before, as well as the traditional singing of God Bless America, the Mets topped them in their Fourth of July celebrations. Before the opening pitch at Citifield they had members of the U.S.O. singing the anthems of the various divisions of the American armed forces. Then they had a Lieutenant-General swear a group of recruits into the army. During every stoppage of play they ran video of soldiers from Queens and Brooklyn in Iraq and Afghanistan greeting their families who’d been given seats at the game. It was a touching and heartfelt display, and really illustrated the connection between the Mets, their fans and those serving overseas. 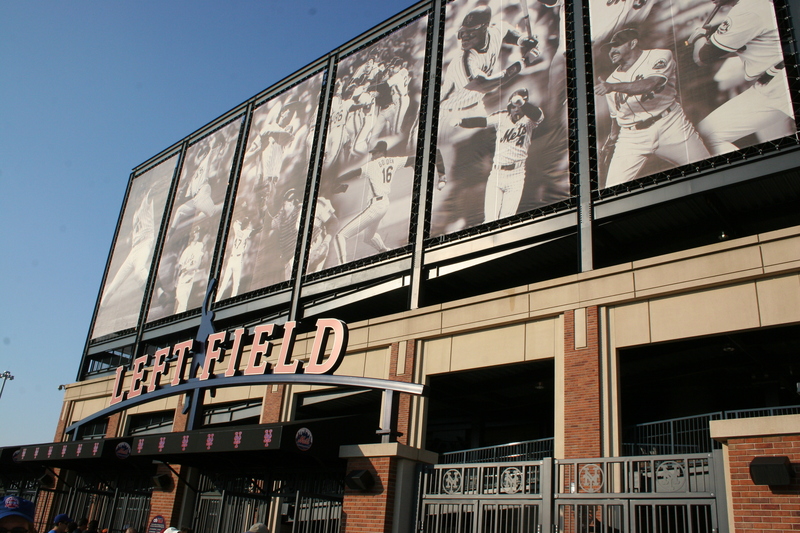 That’s what was nice about the entire Citifield experience – it really balances the old and new and emphasizes the connection between the Mets and their fans in the boroughs of New York City. Also, as a relatively neutral observer, they succeeded in drawing me in to the game and I found myself rooting for the home team despite myself. Although Yankee Stadium has more history and significance behind it, as a venue for watching a baseball game I’d take Citifield any day of the week. Visiting Yankee Stadium – the new one, that is – and watching the Pinstrippers host the Toronto Blue Jays was the focal point of my recent trip to the New York City. It was the fourth major league ballpark I’ve ever been to and easily the most awaited. 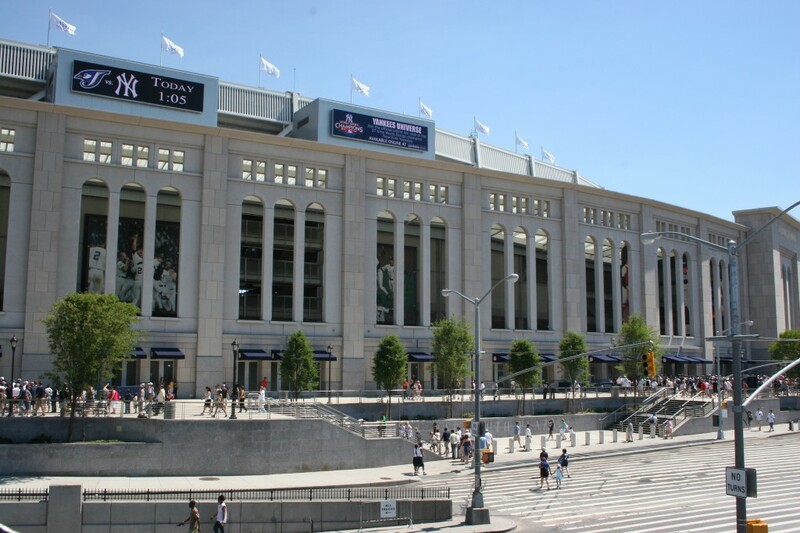 Opened in 2009, the so-called New Yankee Stadium was built across the street from the original Yankee Stadium. I had tried in vain to get tickets at the elder stadium before it was knocked down, but the only available tickets cost an arm and a leg through scalpers. I missed out on the House that Ruth built, but did make it to the underwhelming House that Jeter built. Don’t get me wrong, New Yankee Stadium has a lot going for it. Architecturally, it’s beautiful. The ballpark stands as a monument to the impressive legacy of Old Yankee Stadium, mimicking many of the original field’s most distinctive qualities and emphasizing that this is the home of the most successful franchise in baseball history. The architectural team of Populous insured that the dimensions of the field are exactly the same as the old park, although the new seating is slightly smaller the original field at 52,325 (including standing room) versus 56,936. Also, as you can imagine, the New York Yankees know what they’re doing when staging a baseball game. Every little detail during the game was skilfully handled, from the anthems to the TV timeout features. Charming touches abounded, especially when the Yankees’ current roster recited Lou Gehrig’s famous speech to commemorate the anniversary of his final game with the club. And the food, my God, the food. Every stadium has a signature dish. Something that is distinctly theirs. 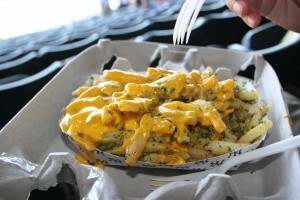 At Yankee Stadium it’s garlic French fries with melted cheese. It’s gooey, salty, cheesey and above all else potent enough to guarantee some space on the subway ride home. Populous did a lot to emphasize the history of baseball in New York City including moving Monument Park from the older building, creating a Yankee Museum and, of course, a centralized merchandise store off the stadium’s main concourse. But that’s one of the key problems with New Yankee Stadium. In their slavish devotion to replicating the style and design of the older building, they did little to improve on the old stadium. Yes, everything is new and shiny but facilities are few and far between. As a result, there are long lines just about every step of the way. Crowds arrive early, so there is a long wait for most of the features of the park, especially Monument Park, the Yankee Museum and the merchandise outlet. In fact, the line for Monument Park was cut off an hour and a half before the opening pitch because security personnel needed to be able to clear it out before game time. Same thing with the Yankee Museum – lines had to be cut off because they were so long. I’ll allow that I went on Independence Day, when most of the crowd was probably from out of town and therefore more likely to go to the touristy corners of the stadium, but surely they could have predicted that those would be crowded sections of the stadium. 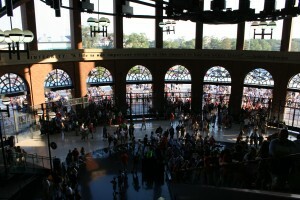 Instead, the entrance to Monument Park is in the middle of a cramped corridor. Compared to other contemporary stadiums like cross-town rival Citifield or Detroit’s Comerica Park, which put an emphasis on wide-open space and breezy walkways, it’s a confusing choice. Ultimately, it’s worth going to Yankee Stadium to say “I’ve been there.” Visitors should expect high prices, long lines and cramped quarters. I would not want to be a Yankees fan and have to attend more than one game per season at that ballpark. As much as I love reading, it’s rare that a book leaves me breathless. 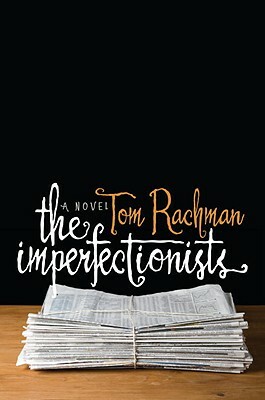 Tom Rachman’s the Imperfectionists does just that, over and over again. Rachman is a London-born journalist who has worked all over the world and he chose a familiar subject for his debut novel – the newsroom of an English-language paper in Rome. Each chapter revolves around a different staff member or reader, with many of their stories intersecting and building on previous episodes. At every interval there is a short story about the history of the paper, colouring in some of the background of the main storyline. It’s a masterful plot structure, deftly done, especially for a first-time novelist. The way the disparate characters and storylines intertwine and relate shows how skilled Rachman is as a storyteller. The book had been recommended to me by my fiancé, who knew it’s tales of deadline drama in a newsroom would appeal to me, and she was spot on. Although Rachman never stoops as low as cliché or caricature, many of the characters rang true. All of the characters are sketched out with a deft touch rarely seen in even the best authors, let alone by a first-timer. Rachman’s cast are remarkably realistic and likeable, creating sympathy for the characters and disappointment when things inevitably turn sour for the protagonists. That’s really my one complaint about the Imperfectionists – it’s unrelentingly depressing. No good deed goes unpunished in Rachman’s world. Characters are craven and selfish. Infidelity is common with everyone ending up alone. Even success comes at a great cost in this world. Half-way through I was dying for at least one good thing to happen to a character. Some sort of ray of hope, one chance at redemption. Anything! I was desperate for a lifeline, but it never came. No, Rachman never gives up on his dark outlook, with the final chapter being one of the most heartbreaking. Despite that, the Imperfectionists is an excellent read that will impress you with its complex structure. Although I was introduced to it because of my occupation as a journalist, I think this book would appeal to anyone. Definitely worth checking out. The Iroquois Nationals in New York City's Times Square as they await their travel visas. As of this morning the Iroquois Nationals lacrosse team continues to be banned from entering the United Kingdom and therefore will likely be unable to participate in the 2010 World Lacrosse Championships in Manchester this week. At issue is the Iroquois’ use of their Haudenosaunee passports, documents that for 33 years have been accepted by Canada, the United States, the United Kingdom and other countries. Unfortunately, as all the citizens of Fortress North America know, in the wake of 9/11 stricter travel regulations have been put in place and the British now refuse to accept the low-tech passports that do not have any bar codes or electronic chips. The Iroquois Nationals were scheduled to play England in the tournament’s first match later today, but instead the host nation is going to scrimmage with Germany. The Iroquois are still hoping to make it to the tournament, but right now their participation is highly doubtful and they will be hard pressed to win the championship, having defaulted a game. They’ll have a lot of hoops to jump through before they can play – although the American government has given them a one-time waiver at the behest of Secretary of State Hilary Clinton, they still need approval from the Canadian and British governments. As I said on Monday, it’s a ridiculous situation. Ultimately, we’re talking about a group of people being barred from playing a sport they invented, because no one is sure they’ll return to a continent they’re indigenous to. One of the most disappointing parts of this story is that its roots lie in the best of intentions. The Iroquois have a national team as a nod to the native roots of lacrosse and the Haudenosaunee passports have been available to the Iroquois people for decades because their traditional lands straddle the Canadian-American border. Although it’s obvious that the Haudenosaunee passports could use an upgrade, it’s apparent that the Canadian and American governments were negligent in excluding the Iroquois and other native peoples from their new security strategy. Why did no one foresee a day when an Iroquois passport holder would want to travel outside of the United States and Canada? Couldn’t this have been avoided? This tournament has been scheduled for four years, so it’s shocking that the three state departments involved could find a way to accommodate the Iroquois. It’s my sincere hope that if the Nationals are unable to participate in the tournament, the 29 teams from other countries find a way to show their support for their Iroquois friends. One option would be for the other lacrosse teams, particularly the American and Canadian teams, to wear purple armbands as a show of solidarity. Of course, the ideal solution would be for the British government to smarten up and agree to allow the 47 members of the team into the United Kingdom. Unfortunately, any chance to avoid one of the most disappointing episodes in lacrosse history has almost passed. Halfway through Dirk Hayhurst’s Bullpen Gospels it occurred to me that I was reading one of the best books on baseball, ever. That’s some strong talk, particularly for someone who hasn’t read the entire baseball canon. But I’m getting there - just about every other book I read is about baseball. I’ve devoured Jim Bouton’s Ball Four more than five times, I loved John Feinstein’s Living on the Black and Michael Lewis’ Moneyball. Also, as fans of this blog know, I’ve reviewed the graphic novel Satchel Paige:Striking Out Jim Crow as well as Sports Illustrated’s Great Baseball Writing. The Bullpen Gospels slot in right above all of those, including Ball Four, my previous titleholder. They’re comparable books too. Both are written by professional baseball players who find themselves pitching long relief in a bullpen full of odd characters. Yes, Bouton was an established major leaguer trying to master the knuckleball while Hayhurst, at that point, was a career minor leaguer in the San Diego Padres organization, but they’re still pretty similar books. Bouton’s book is infamous for exposing the real lives of baseball heroes like Carl Yastrzemski and Mickey Mantle at a time when they were idolized by most fans. The aging Seattle Pilots reliever took a lot of heat for the book, with many people saying Bouton was a gloryhound. I don’t agree with that sentiment, but it certainly reads like an expose. Love it or hate it, Ball Four is a hilarious and insightful read. But, by contrast, the Bullpen Gospels is a much more genuine and sensitive story. Starting with Hayhurst’s truly dire home life with an unbalanced grandmother and a fractured family crippled not by one, but two, alcoholics you immediately feel for the young reliever. When he moves on to spring training and the minor leagues you can’t help but appreciate his sense of humour. Perhaps the most noticeable difference between Hayhurst and Bouton is that the former rarely criticizes his teammates or the Padres’ executives. On the few occasions when he does speak poorly of someone, it is a reasonable and measured critique, and he shies away from dropping big names for the sake of glamour. The only person Hayhurst is really hard on is himself. 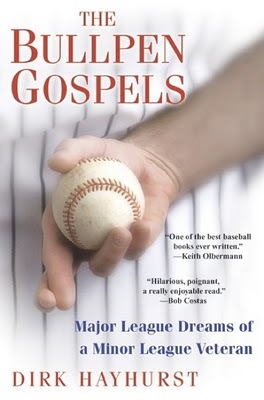 Gospels is a quick read that makes its way through an entire baseball season, with a truly joyous ending. It also imparts a better understanding of what life in the minors is like for aspiring ballplayers. Hayhurst is an effortless and charming writer. He’s likeable and always sincere in his beliefs. I’d recommend this book to anyone, particularly as a companion to Jim Bouton’s Ball Four. Earlier today the Associated Press reported that George Steinbrenner, the long-time owner of the New York Yankees, died at the age of 80 after suffering a massive heart attack. Steinbrenner’s passing was confirmed by the Yankees organization, as well as his family who issued a statement. I wholeheartedly agree with those sentiments. George Steinbrenner was the best owner in baseball, and arguably, in all of professional sports. Consider the Yankees without the seven World Series championships (2009, 2000, 1999, 1998, 1996, 1978, 1977) they won under his direction. It’s hard to do. That means no Mr. October, Reggie Jackson. Derek Jeter, Mariano Rivera, Andy Pettite and Jorge Posada wouldn’t have been the Core Four of the dynasty of the late 1990s and early 2000s. The New York Yankees, the Evil Empire as we know it, would not have existed without the leadership of the Boss. Now some may argue that Steinbrenner’s influence damaged the game. As a season ticket holder of the Toronto Blue Jays, I can sympathize. The war of attrition with the Boston Red Sox in the American League East with both teams stockpiling arms like Cold War superpowers has basically ruined any chance of my hometown team winning a pennant. But that’s a situation that can’t be entirely blamed on Steinbrenner. Major League Baseball made the luxury tax rules, he merely played within their bounds. I can’t say that I blame him. Any owner – any person, for that matter – should pursue success to the fullest extent of their resources. There’s no point in hating Steinbrenner simply because he had more resources than everyone else. I’m sure that one of my colleagues in the media is going to write a similar eulogy about how Steinbrenner is the last of a dying breed. How we’ll never see another person make such an impact as the owner of a professional sports team. Although George Steinbrenner was a unique character, there will be more owners like him. Already in the National Basketball Association we have Mark Cuban and Mikhail Prokhorov, the owners of the Dallas Mavericks and New Jersey Nets respectively, both cast very much in the Steinbrenner mould. No, I think that Steinbrenner serves as the prototype of what the owner of a professional sports team can be. An ideal example that other owners should model themselves after. He was one of the greats, and although his New York Yankees are often hated, his is a legacy that should be admired. It’s been weeks since I last posted on ye olde blogge, thanks largely to my ongoing involvement with the development of new content for Canada’s Sports Hall of Fame. But since I was waiting on some editorial turnaround, I decided to go on a baseball pilgrimage of the northeastern United States, touring the baseball Hall of Fame in Cooperstown, N.Y., the new Yankee Stadium and Citifield in New York City and then on to the oldest stadium in the majors, Boston’s Fenway Park. It was at the home of the Red Sox that I proposed to my fiancé Katy, capping off an amazing vacation. But I owe you, my readers, an apology. I was so busy planning my trip and proposal that I didn’t do my due diligence and post links to my most recent writing before leaving for the U.S. I’m sorry because I like to keep you all updated on my various projects. Recently, I’ve been doing some pretty exciting work for HockeyPrimeTime.com, including a draft preview, a free agent preview and a notebook, all on the National Hockey League’s Northeast division. Even worse, my holiday matched up with one of the craziest fortnights in sports history. Let’s recap with a few quick hits. Only Japanese officials from now on – Yes, early favourite Spain did win the World Cup on Sunday. But their victory, along with the results of many other games, was tainted by terrible officiating. What was particularly galling in the championship game was that Spanish forward Andrés Iniesta’s winning goal was made possible by an undeserved goal kick - the ball had clearly been deflected out of bounds by a Spanish defender. By my eyes, the only consistently strong officials hailed from Japan, odd for a nation that has only recently taken to soccer. The 2010 was a huge opportunity for FIFA to expand its brand to North America, a chance that was blown by the officials. Iroquois Nationals might not make FIL World Championship – In a completely bizarre situation, the Iroquois Nationals team is currently unable to attend the lacrosse world championship in Manchester, England later this week. This is totally nuts. Yes, they’re travelling on a very specialized kind of passport, but the Iroquois are all Canadian and American citizens and upstanding ones at that. The idea that they might miss out on playing a sport they invented because they can’t return to a continent that they’re indigenous to is pure lunacy. The Decision LeBacle – I know, I know. Everyone and their aunt has already talked about LeBron James’ one-hour ESPN special where he callously announced his move to the Miami Heat. But how can I not talk about it? It will undoubtedly become one of the turning points of sport in the past 50 years, not just because that hour of television was a public relations disaster, but because it’s going to change the face of free agency in the National Basketball Association, and probably other major league sports as well. I’ve got a lot more to say on all these topics, but I’ll leave you on that note. Blogging on weekdays has returned! Brap-brap.